There’s a lot of ugly talk out there. There’s a lot of ugly talk by Christians about LGBT people. It pains me. Even before it felt so personal, it would have pained me. I’m still learning how different it feels when the words apply to me as well as lots of people I love and plenty of people I don’t even know and even a few I don’t like, but for reasons having nothing to do with the fact about their lives and mine that puts us in the middle of a cultural flash-point. And in case you think I’m exaggerating, I’m not. When a preacher stands up in a church and suggests that gay people be enclosed in electrified fences, as a way to get rid of them since they can’t reproduce, so surely they will eventually all die off…well, it is such a collision of ignorance and fear and bigotry that I finally understand in a visceral way the meaning of homophobia. I had the luxury of parsing the word, before, you see. You can’t handle it now. 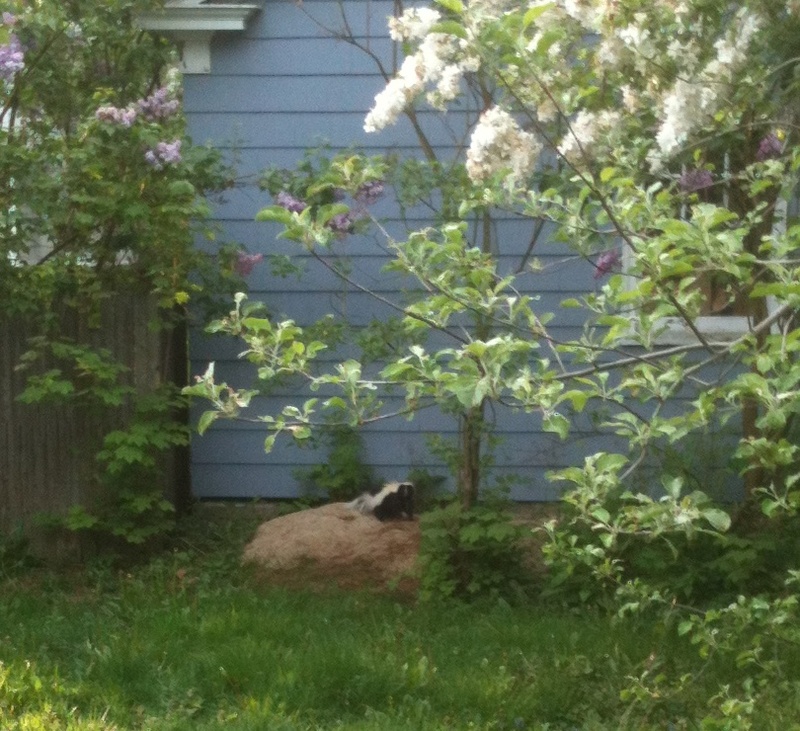 In my backyard there is a family of skunks. I live in the middle of a densely populated neighborhood. The single-family houses are close together. If one of us has skunks, all of us have skunks. Friends with a more rural mindset have suggested shooting the skunk, which would be illegal in my city, and also not something would ever consider doing or be able to do. But we can’t live together, so there are traps in my backyard, and I have the number of the nice man who will come and take the skunks away if they follow the bait of marshmallows and end up with the trap door closing behind them. I really wish we could live in peace together. They eat pests and are rather adorable, although I never imagined I would be saying that and seeing one up so close. But I have a large dog who needs his small backyard, and I have neighbors, as I mentioned before. So if all goes well, the skunks will be relocated. Because the mother would abandon her young if set free, they’ll go to a place where they are kept together until the babies are weaned, and only then will they all be released into the wild. I have suffered in mind and heart over the fate of the skunks. Right now the cages are in my yard, empty, and I do not know what I will find in the morning. I guess I hope she’ll catch a hint and move her family, but more likely in a day or two, I’ll be calling the nice man to tell him the mama is in the trap, and he’ll come look for the babies, and this will become a story I tell later, in which I remind myself that in a difficult situation, in which we cannot all share the same space, I did the best I could for the skunk family. And I compare that to the way you would like to treat human beings, and I cannot understand how it is we claim the same Lord, the one who loved us so much that he laid down his life for us, the one who said over and over again that people would know us as his followers by how we love others. People like you sometimes suggest that people like me cannot really be Christians. I don’t want to be a person who sets those kinds of limits on others. I like to leave a little more room for the Spirit to work. I am praying that your heart and your mind will be opened, and that you will close your mouth long enough to listen for the Spirit of God. Maybe you can’t handle it now. But that doesn’t mean the day can’t come. God is pretty amazing, after all. oh this IS delightful…I KNEW those skunks were going to become literature. This puts me in mind of the biblical bit where a prophet questions whether certain aromas are pleasing to God. If SkunkMama has inspired this wonderful reflection, I would say God approves–if not of her aroma, then certainly of her witness! Thank you!!! I am glad you could respond. His sermon triggered me to the point of my blood pressure rising. I strive to be a gentle person, but this kind of hate drives me to rage. Wait, we’re not the skunks in this story, are we? Just kidding. Your point is well taken. Thank you! Love this. So very well-done. I love this. Totally. I have been so upset at all the *Christian* talk I have heard lately and his sermon just made my heart sink. You are such a good kind person. gracefully and graciously said Martha! So powerful. Thank you for your calm response to hate, such a strong model. Thanks, y’all. And many thanks to those who shared the post on Facebook, though sadly Facebook won’t let me figure out who you are.